What’s the Next Big Thing for Voice Assistants in 2019? Voice assistants continue to gain momentum, but there’s still little clarity around how this new interface affects the brand-consumer relationship, and how brands need to reposition themselves in light of this. With strong chances of more growth on the horizon, stakeholders in voice tech are having to consider questions that underline its durability and monetization potential. Above all, they’re grappling with the need to commercialize voice assistants, and solidify the role they’re playing across the purchase journey. There’s more growth to come. Even in the last year, we’ve seen a significant growth in uptake. 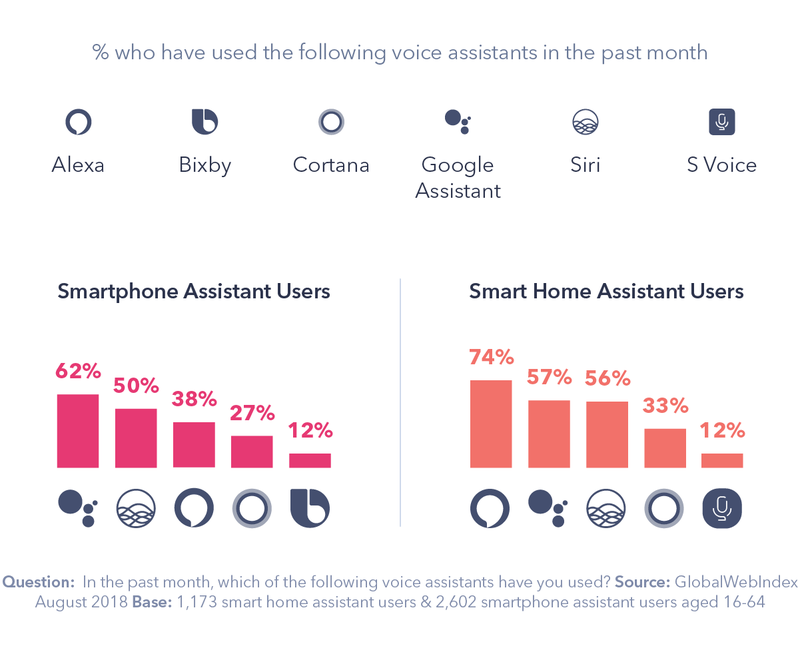 Just under half of online adults are now using voice technology in some way – whether that’s through voice assistants on smartphones, or smart home assistants. Asia Pacific are currently the most engaged with voice technology, with over 1 in 2 using voice search tools in some capacity. European users lag behind the other regions as the least enthusiastic, but, tellingly, they’re also the least likely to say that owning the latest technology is important to them. 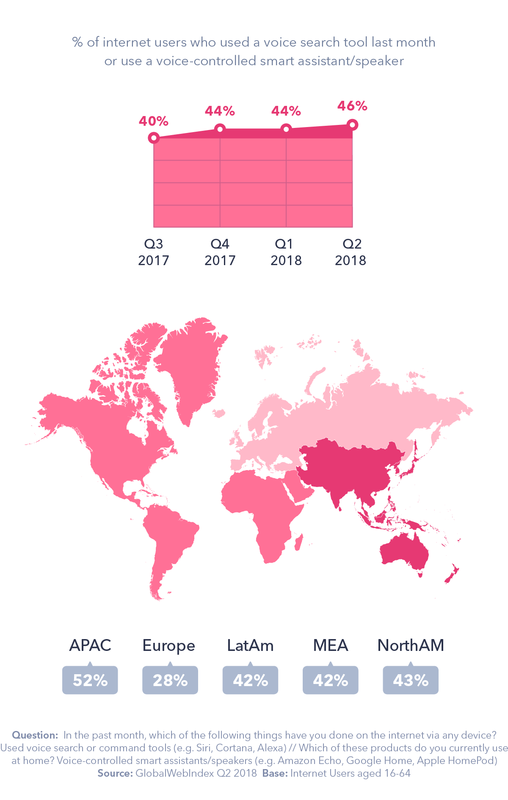 From a market-by-market perspective, we clearly see that voice search growth is being driven by the key Asian markets, with India, China and Indonesia coming out on top. 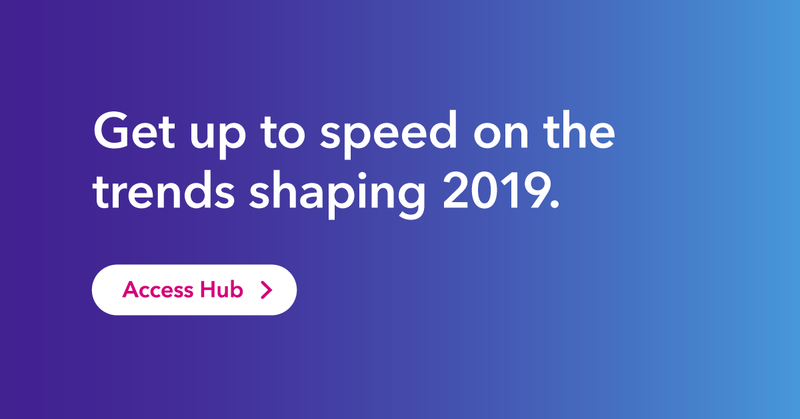 Many of the world’s emerging markets represent key growth areas for voice, as they hold millions of consumers who are yet to be connected. These consumers’ introduction to the internet is likely to be via smartphone, so the importance of integrated voice assistants, alongside frequent upgrade cycles, shouldn’t be underestimated. For voice tech uptake to continue at speed, it needs to increase exposure, and smartphones are a platform to do this. They’ve put voice search tools in millions of pockets, and did so without relying on consumers consciously purchasing a voice-enabled device. Voice tech’s integration into cars is another example of this. In a special study in the U.S. and UK, we found that “when driving” was the most common daily occasion that mobile voice users were speaking to their smartphone assistant. Auto is an industry where voice can really demonstrate its value, as driving is an activity where consumers can truly benefit from its “hands-free” nature. Industry initiatives from leading auto brands demonstrate the acknowledgement of the potential for voice integrations, whether via existing stand-alone assistants, like BMW and Amazon’s Alexa, or auto brands’ personal built-in assistants, like Kia and Hyundai are introducing from 2019. How should brands position themselves in voice? The change in user interface from conventional search methods to voice assistants has important implications for any brand proposition. Voice interactions in this new search environment are fundamentally different and more personal than interactions taking place on social media or search engines, and this raises the stakes for brands. Having a dialogue-based interaction gives brands an important opportunity to redefine their brand proposition using completely new variables. This encourages them to get creative and think outside of the box to make full use of the voice assistant experience. What’s a brand’s gender, and what does its voice actually sound like? What accent does it have? Is the brand’s personality on the voice platform personable, informative, or colloquial? These are just some basic examples of how brands need to reframe their thinking to optimize their voice experience. In the voice assistant market in the UK and U.S., Amazon’s Alexa and Google’s Assistant have the most significant market share. Amazon’s success in the smart home device market is thanks to aggressive discount periods for its Echo, which have helped to solidify its position. With Google Assistant being the default interface on Android smartphones, it has a high likelihood of strengthening its position in the market given the frequent handset upgrade cycles. This means brands must look to these assistants to deliver their voice experiences at scale. These assistants carry with them their own imprint on the delivery of the experience, potentially keeping the brand’s interactions within the boundaries of the assistant’s personality itself. On top of this, brands must also consider how the delivery of these experiences differs between voice-enabled devices. Among mobile voice assistant users, our research revealed that functional activities are the leading use case for this tech, like asking for directions or for checking the weather. Home assistants, on the other hand, provide a more relaxing and interactive experience. 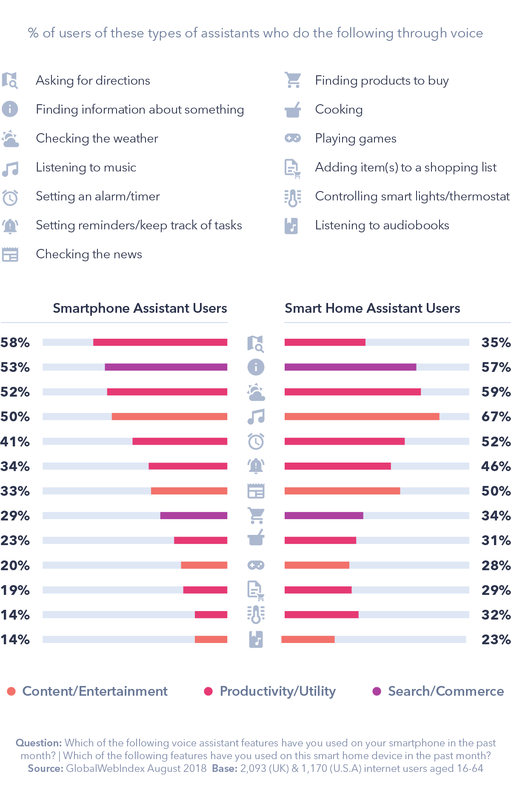 We also found home assistant users perform a greater variety of behaviors on average, with an emphasis on content and entertainment, like streaming music. But as these interactions are short, so is the window of consumer attention. Home assistants, in particular, can become an integral centerpiece in people’s homes, but not while the opportunity to use voice is still very limited. They’re struggling to reach “assistant” status. Amazon’s working to connect the overall experience and truly make Alexa a useful assistant — introducing a series of new integrations like Echo Auto for cars, and an Alexa wall clock and microwave — but even then, success relies on consumers being convinced by the value of this connected lifestyle which goes beyond a novelty. But for brands, this highlights the need to align their approaches on each device to the kind of environment the device sits in. For mobile voice assistants this means helping users make quick decisions on the go, and for home assistants this means delivering a fun, interactive or relaxing experience. But assistants like Alexa or Google Assistant don’t currently differentiate their personalities between devices or contextual environments, and this will be a key issue to overcome as more brands join the fray and consumers demand more natural voice-enabled experiences. Closing the loop in the path to purchase. Voice assistant devices offer one of the most direct paths to purchase available, but they only excel in certain areas of the consumer purchase journey. To realize their potential as commerce devices, they need to close this loop. Globally, we see that consumers like to inform themselves before committing to a purchase by making use of a growing list of research channels. Consumers also like to see what they buy before they buy it, with social media having seen a 50% increase as a product research channel since mid-2015. Voice assistants can’t yet deliver on these consumer demands, having little to offer in the way of informing consumers on products between the brand discovery and buying stages of the purchase journey. As such, anything that requires high research or investment is less likely to be purchased, limiting the scope to low-price, everyday product categories or frequent purchases. Brands also face the challenge of getting in front of their target consumers in the first place. And this brings us to one of the most pressing junctures in the growth of voice technology: how to commercialize voice assistants. The challenge of commercializing voice assistants. Amazon and Google both operate under very different business models. This simple observation gives us a glimpse into how each company may look to monetize their voice assistants. Monetizing Alexa will most likely involve using the assistant to tie together the various touchpoints in Amazon’s ecosystem, driving users to always engage with or buy from Amazon no matter what they’re doing online. 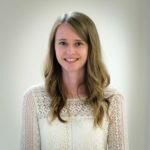 While Google has its own ecosystem, its considerable presence in the online advertising market indicates that Google Assistant is set to help Google retain its position as search habits shift to dialogue-based interfaces, especially as Amazon itself looks to carve out its own share of the online advertising market. In every case, voice assistants seem to be poised to incorporate advertising or product recommendations in the near future to prove their worth. But will consumers be receptive to commercial messaging delivered via voice assistants? This is one of the most important questions in the voice industry right now, and will continue to be in the coming year. The scale of ad-blocking in every region and the motivations behind it tell us that a significant amount of consumers feel ads are intrusive and overabundant online, and are willing to act on this frustration. If a significant number of consumers are already disillusioned with the state of advertising online, how will they feel about ads or recommendations delivered via a voice interface? Voice interfaces don’t support lists of items very well, meaning if a user asks for a recommendation, any that are made might not be perceived as truly authentic. This is because any options that reach the end user may have sponsorship or corporate interests behind them. There’s also the question of whether there’s room for commercial messaging in the environments voice assistants sit within. Almost two-thirds typically keep the device in their living room, and for more than half, it’s in the bedroom. These are relaxing and interactive environments, but most importantly, they’re very personal. The challenge of delivering ads or recommendations in these environments without being intrusive may force brands and marketers to hone in on contextual targeting to avoid the mistakes which lead to ad-blocking. Solving this overarching challenge is crucial in the development of voice assistants. But solving it also requires appeasing long-standing privacy issues. As the media noise surrounding recent privacy scandals and legislation gets louder, the security of emerging and unfamiliar technologies like voice assistants also comes under scrutiny. “Active listening” tech puts devices in the security spotlight. Two-thirds are using private browsing windows, and 6 in 10 are blocking ads each month. And tellingly, for consumers in the UK and U.S. with no interest in purchasing a home assistant in the future, the perceived security of these devices was a leading concern, with around a quarter saying this. Voice assistants’ “active listening” technology puts it in the security spotlight. There are questions being raised on how much these devices hear, and whether they can distinguish between voices efficiently enough to safeguard individuals’ private information. The push towards contextually-driven interactions could help bridge the gap between consumer reservations and effective recommendations delivered in a more natural manner. And although the voice assistant interface is only able to deliver top-position entries in its recommendations, a look at the attitudes of voice tech users reveals a promising prospect on commercial messaging on these devices. 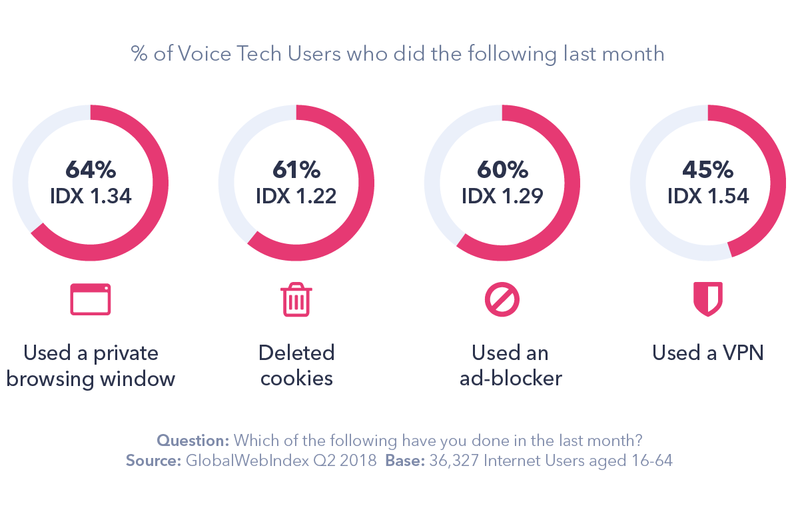 Around 2 in 3 voice tech users say that they think there’s too much choice online, and this links to a wider trend where some consumers feel very attached to technology, but are overwhelmed by the so-called “infinite shelf” online. So while voice assistants seem well-placed to solve the problem of overwhelming and overabundant choice when looking for products online, the delivery of the recommendations hangs in the balance. No matter how you look at it, voice assistants need to commercialize, and it’s in the next year that we should see this initiative begin to surface seriously. The challenge for brands lies in deciphering how to connect with consumers across the various contexts of voice assistant engagement in a way which doesn’t come across as ingenuine, inauthentic, and, above all, intrusive.